This year, the United Auto Workers union will negotiate new contracts with auto and truck manufacturers General Motors, Ford and Chrysler, as well as with tractor and farm equipment maker John Deere, and other major corporations. On March 24 and 25, the union held its “Special Bargaining Convention” in Detroit. Keeping with tradition, the delegates from hundreds of locals around the country and in Canada and Puerto Rico discussed and passed a 72-page resolution, prepared in advance and reflecting the orientation of the UAW’s International Executive Board. The UAW has more than 390,000 active members and more than 600,000 retired members in the United States, Canada and Puerto Rico. While there was a controlled and even staged atmosphere, the rumblings on the plant floors could be felt on the floor of the convention. For two days, two-tier pay was the hot topic among the rank-and-file delegates. Here is the message the shop floor sent to the convention: The companies are making record profits. Every worker deserves a raise. A fight at the bargaining table for “equal pay for equal work” is long overdue. Two-tier pay is a capitalist scheme to drive wages down for all workers. As a first step, a union agrees to a permanent lower wage, but only for workers who have not yet been hired. Eventually, through attrition — the loss of higher seniority workers who retire, quit or die — all of the workers left will be those who started at the lower wage. That in itself cuts all workers’ wages. It’s not the only downside to two-tier wages. In the interim period, workers work side by side but get unequal pay for the same work. 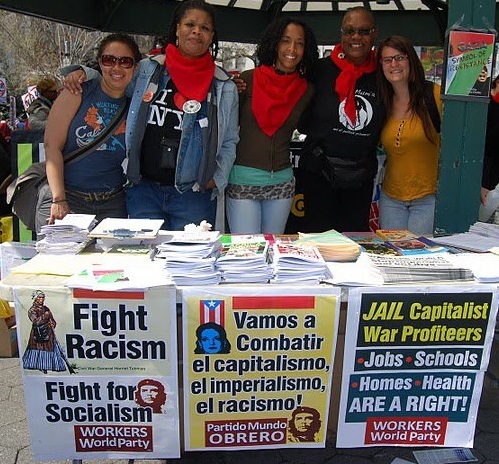 As a leaflet distributed by the rank-and-file group “Autoworker Caravan” points out, this leads to a divisive “us and them mentality” that turns worker against worker and disrupts the worker solidarity needed for a successful struggle against the bosses. Two-tier began in the airline and retail sectors in the 1980s. It is now commonplace in both public and private sector contracts. The first two-tier contract with the UAW was at the construction and mining equipment manufacturer Caterpillar after the company succeeded in breaking a long strike. Two-tier wages then spread to the parts suppliers and to Detroit: the three contracts with General Motors, Ford and Chrysler in 2007. In reality, there are more than just two tiers of wages in the auto industry. Alongside UAW members at Ford, GM and Chrysler are outside company employees who are paid even lower wages. In contracts with parts suppliers there are often more than two pay scales. Auto workers, especially the vast majority who are unorganized, are part of the low-wage workforce — making little more than their counterparts at McDonalds and Walmart. A prime example of low pay is the Lear plant in Selma, Ala., which supplies seats to Hyundai. Workers there are fighting for a living wage. It was announced at the convention that Kim King, a leader in that fight, had just been fired. Taken in its entirety the resolution was a series of contradictory statements. Statements that, “We’ve had to fight to win fair contracts” contrasted with support for “the German co-determination model.” The German model is supposed to substitute discussion between the union and management for raw class struggle. In effect, “co-determination” reinforces collaboration between the union leadership and the bosses by limiting what issues can be addressed through collective bargaining and the grievance procedure. 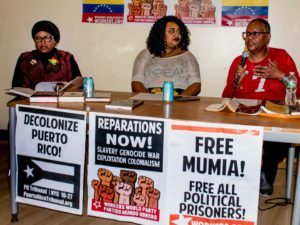 Speakers against the resolution opposed the weak and deliberately vague phrase, “bridging the gap,” a slogan repeated throughout the convention. Local 551 Vice President Scott Houldieson from Ford’s Chicago assembly plant proposed changing the word “bridging” to “eliminating” so the result would read, “eliminating the gap,” that is, making sure there is equal pay for equal work. Speaking for the top UAW officials, International President Dennis Williams rebuffed Houldieson’s amendment. But many rank-and-file delegates embraced language that spoke to fighting for equality and justice. Delegates also voiced anger about the “alternative work schedules” that undermine the eight-hour day. “You will create a lot of jobs,” said delegate Kathy Smith from Chrysler’s Trenton Engine Plant, because “workers will die” from working long hours and constantly switching from day shift to night shift. The resolution says nothing about restoring the eight-hour day and the weekend, which past generations fought and died for. At last year’s Constitutional Convention, the leaders asked for and got a dues increase, with the stated purpose of bolstering the strike fund. Now the union must start talking about using the funds for their intended purpose — to support a strike. Only by fighting for their rights can the auto workers halt the fall in wages and benefits, heal the divisions and strengthen solidarity. Martha Grevatt is a 27-year Chrysler worker who represented UAW Local 869 at the convention as an alternate delegate.